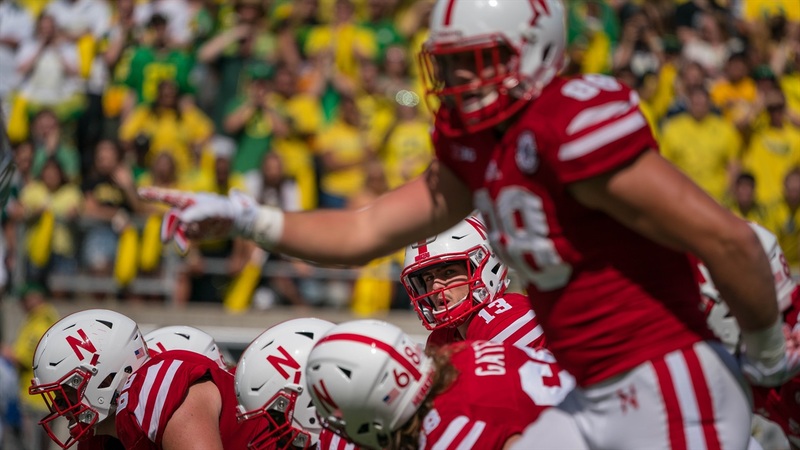 EUGENE, Ore. – Regardless of what had happened in the first 57:43 of Nebraska’s 42-35 loss to Oregon on Saturday, the Huskers had the ball down seven and two minutes to march 60 yards for the tie. Nebraska’s bid for a 28-point comeback came to an abrupt end, however, as Tanner Lee’s fourth interception ended the game, making it this week’s Play of the Game. Some weeks, we open the voting up to the fans on Twitter to determine the play of the game. Others, I make an executive decision when it is clear which play meant the most to the outcome of the game. That is the case this week. Nebraska had just forced a critical three-and-out, giving the Huskers the ball back with 2:17 on the clock but no timeouts. On first down, Nebraska faked a hand-off to Mikale Wilbon then sent him out into the flat to the left side. Tight end Tyler Hoppes came across the formation from the left side after the snap to provide an extra blocker. Oregon only rushed four. The left defensive lineman rushed towards the middle while the left outside linebacker looped wide. Right tackle Matt Farniok looks to double-team the interior lineman, but the Duck gets inside of right guard Tanner Farmer and Farniok ends up touching no one. Hoppes was left to take on the linebacker, Jonah Moi, by himself. There’s no pocket for Lee to step up into as the defensive lineman beat Farmer through the A-gap and pushed him back into Lee’s lap, and Moi gets by Hoppes who can’t move laterally quickly enough or get enough leverage against Moi after running across the formation to keep him away from the quarterback. Lee tries to fire the ball downfield to Stanley Morgan Jr. up the sideline, but Moi gets a hand on the throw, turning it into, well, a duck. Cornerback Ugochukwu Amadi runs under it for the interception and takes it back 21 yards. Oregon ran the ball twice then took a knee to run out the clock. As Langsdorf said, the tight end got beat, but it seemed like a fairly difficult blocking assignment for him. Either through a strange protection call or a lack of execution, Farniok was left blocking no one while Lee got pressured from two sides. However, after the game, Lee took the lion’s share of the blame for holding on to the ball too long. Regardless of where the blame falls, the interception ended the game, for all intents and purposes. Nebraska scored 21 straight points, had a chance to tie the game with a scoring drive and immediately gave the ball back on their first snap. That is why Tanner Lee’s fourth interception is this week’s play of the game.